The Art of Anthem reveals a scrapped storyline that could have changed everything. Unfortunately for EA and BioWare, Anthem has taken a real kicking since it launched at the end of February. Criticism over its plot, structure, and mission design arguably isn't the worst of it, though—the kicker is how much better the original story might have been. As revealed in The Art of Anthem, the game’s premise was very different once upon a time. Early drafts featured a colony ship from Earth that had crash-landed in what was essentially the ‘Bermuda Triangle’ of space. “Survivors would have to settle, survive, and somehow thrive on a harsh and dangerous world,” writes the game’s art director, Derek Watts. “These ships were only in that first iteration. We took this quite far along before we switched to what Anthem would eventually become.” You can see it for yourself via a sample on Google’s online store. What followed was a Robinson Crusoe-style struggle against the odds as your crew salvaged modules into houses, ramshackle bars, and outposts. An entire settlement is seen to have sprung up around the carcass of this ship in later concept art, and its citizens are dressed in what’s left of old Earth clothing. You can actually catch a glimpse of this version in a video BioWare shared during E3 2014, edited below by YouTube channel BSN: a broken-down hut made from NASA components is visible toward the end of that footage, and Anthem’s mushroom-shaped mountains loom large in the background of the scene. You probably wouldn’t have been the only ones who’d crash-landed on this planet, either: one painting depicts human survivors watching as a new ship tumbles to the ground, and it stands to reason that others would have arrived before you. Possible conflicts here make sense: as well as other human factions, it's possible you could've been pitted against aliens carving out their own kingdom, which would've taken it a little closer to the premise of Mass Effect Andromeda. There’d still have been room for long-form mystery in the Anthem of Creation nonetheless. Perhaps Anthem’s Shaper mythology could remain intact as well, resulting in a storyline you’d uncover as you travelled. The whole thing is an idea some members of the studio seemed keen on. As alluded to above, it was “a unique vision that the art team was very passionate about. But in the end, we needed to adjust it to give the IP more depth and flexibility”, says Watts. 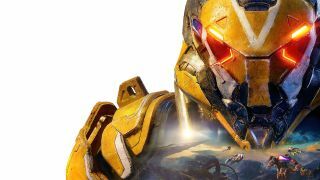 At some point, Anthem became what it is now—games, of course, are always subject to extensive changes during development. Either way, it’s a shame this never came to fruition, and it might've imbued Anthem's world with more of a sense of adventure and discovery. If you’d like to learn more about the behind the scenes on BioWare's latest, the Art of Anthem is available online in hardback or as an ebook. It’s definitely worthwhile if you’re a fan of art and the process behind games. You don’t have to shell out full retail price if you shop around, either: I got mine from Comixology for $20/£14.